Japan telemedicine market is projected to exceed USD 2.7 billion by 2025. Japan has one of the most advanced telecommunication technologies that enables quick implementation of telemedicine platforms. Medical insurance coverage, improved healthcare, rise in incomes and urbanization is anticipated to bolster the telemedicine market in this region. 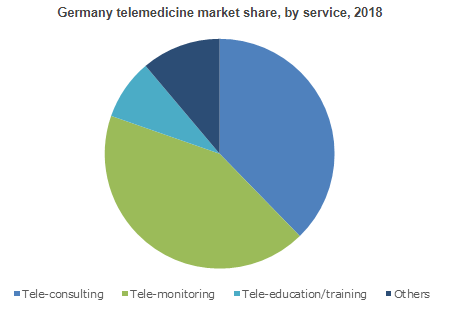 Worldwide Telemedicine Market is expected to surpass USD 130.5 billion by 2025; according to a new research report by Global Market Insights, Inc. Increasing need for cost reduction of healthcare services is the major factor for growth of telemedicine market. Tele-consultation reduces time and cost of patient visit to a hospital. Telemedicine platform enables quick response to patient?s needs and healthcare personnel can effectively treat an emergency case, thereby fostering telemedicine market growth. Tele-education/training market is forecasted to expand at 20.8% CAGR across the forecast timeframe. High growth rate is credited to increasing adoption of telemedicine platforms in developing economies. Furthermore, major market players are exploring untapped markets in growing economies, that will boost tele-education/training market in the future. Telehome market will reach USD 45.2 billion by 2025. Affordable high-speed internet and increasing smart phone and wearables adoption will rapidly boost telehome market. Moreover, increasing importance of real-time monitoring of elder patients will further propel market growth in the future. Telehospital market is forecast to reach USD 85.3 billion by 2025. Telehospital business is poised to witness high growth across the globe owing to growing telecommunication infrastructure. Telehospitals provide virtual hospitalist presence in rural hospitals that are unable to support full-time on-site physician. Moreover, rising exchange of knowledge among healthcare providers will further boost telehospitals business. Application of telemedicine in neurology is forecasted to expand at 20.0% CAGR across the forecast timeframe. Increasing prevalence of neurological disorders such as Alzheimer?s disease and Parkinson?s diseases will foster market growth in the future. Also, with real-time consultations and remote patient monitoring, the quality of healthcare service provided will improve, thus leading to market growth. Web/mobile industry is expected to reach USD 80.2 billion by 2025. Increasing penetration of smart phone and internet users in both developing as well as developed countries will be a major factor boosting market growth. Increasing technological advancements and growing telecommunications network will positively drive market growth.